We're grateful to Stuart Warren Twigg for sending us this scan of an advertisement he found in an old diary for 1978. 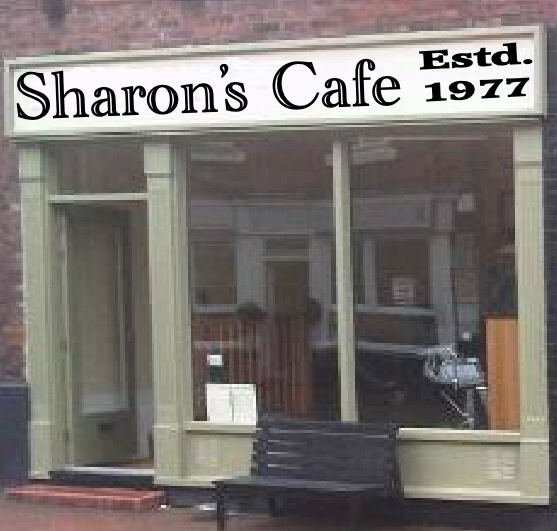 It enables us to put a name, at last, to the cafe which Sharon Barnard remembered from her childhood and we talked about in this memorable diary entry. 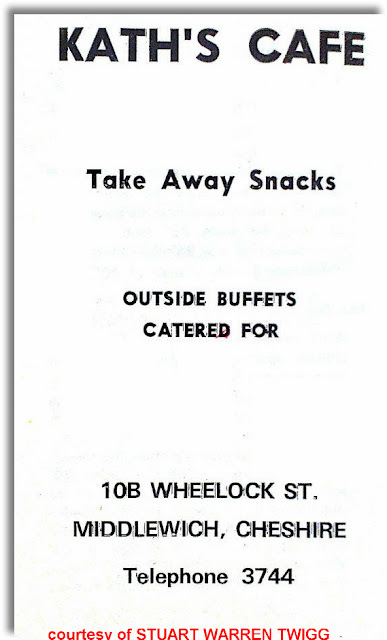 This is just one of a selection of 1978 ads from what must have been a real-life Middlewich Diary (as distinct from a virtual or internet one) and we'll be featuring them all here in due course. There are six of these adverts in all. Some of them are for well-known Middlewich businesses of the time, but only one of them, for the Golden Lion, relates to a business which still exists today. 1978 is not really all that long ago but in terms of local advertising it is part of a bygone age. There was little or no self-publishing and prospective advertisers were largely in the hands of whoever printed and published the diary when it came to design and choice of typeface etc. Certain stock images ( forerunners of what we now call 'clip art') were available, as we'll see in later adverts in the series, but, on the whole, the choices were quite limited unless advertisers were prepared to fork out quite a bit of cash. Kath's advert must be the most basic of them all. Just one very smudgy typeface (could that be Ariel or something similar?) and acres of white space. This advertisement (and the others in the series) have all the hallmarks of something printed just before the dawn of the computer age. 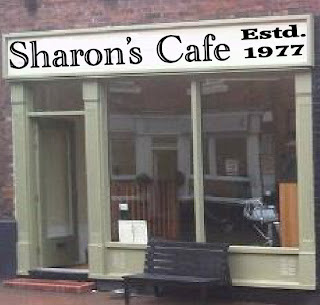 It's nice to be able to put a name to that 'cafe near The Vaults' from all those years ago, but as I've said before, it will always be 'Sharon's Cafe' to us. However, if you know who 'Kath' was (or, we hope, still is) we'd be happy to hear from you. Steve Dean I think it was Kath Fahy? Geraldine Williams Yes, I thought that. Philip Yearsley Definitely Kath Fahy. Superb sausage butties. I had a few of them, as you could tell, Steve!